Lemon balm (Latin name – Melissa officinalis) is a perennial herb. The leaves have a gentle lemon scent which are used to flavour ice-creams and herbal teas. 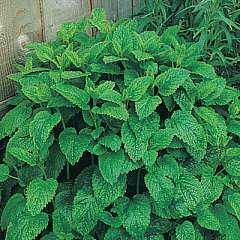 Lemon balm has a bushy habit and grows to a height of 50cm (20inches.) although it can be trimmed. It is vigorous and can take over, so is often grown in a pot or container. Place in a propagator or a polythene bag and keep at 20-25C (68-77F) until after germination which takes up to 21 days. Leave in a light place. Plant out Lemon balm plants between 12 and 15 inches (30 and 38 cm) apart. Remove flowers to prevent self seeding. Harvest the young leaves when they are 10cm hight and bright green. Use the leaves of lemon balm in stuffings for fish & poultry. How To Grow Culinary Herbs is an ebook produced by TopVeg and FarmingFriends. The ebook is on sale now and explains how to plant a herb garden or grow your own herbs for cooking.